I first came to Nanaimo in 1970 and if my memory serves me correctly there was an Overwaitea Store and a Safeway Store in the Terminal Park shopping mall. Overwaitea was more of a junior store than the Safeway of the day. I am foggy on when the transition took place but I believe at one time Safeway moved out of the Terminal Park location and Overwaitea, which had occupied the building that is now the Liquor Store, moved into the current location after renovating the store. They operated as an Overwaitea store until going through another period of transition when the owners of the store were threatening to close it due to labour issues. Those issues were finally resolved, and the store underwent another renovation and sooner or later adopted the Save On Foods brand, under which it has operated these recent years. In a logic defying move the powers that be allowed Save On Foods to acquire the Thrifty Foods location in Brooks Landing in what was said to be better for competition involving the sale of different locations between Save On Foods and Sobeys who now own Thrifty Foods. How this improved competition is a bit of a mystery as it meant we had a Save On Foods at Terminal Park, Brooks Landing, Country Club and Woodgrove. This latest move does nothing to improve the immediate neighbourhood around Terminal Park who have had the convenience of a grocery store in this location for as long as I can remember. The area certainly seems able to support a grocery store at Terminal Park and Brooks Landing as there has also been a grocery store at Brooks Landing for as long as I can remember also. When Brooks Landing was known as Northbrook Mall it was home to a Super Value grocery store and to my knowledge has always been home to a grocery store under several different brands until this latest transition. Since the Terminal Park building is owned by the same company that owns the Save On Foods at Brooks Landing it is likely they will not allow another grocery store to occupy that location. Perhaps it will become home to the latest Pattison car lot, or maybe the building will make way for more housing?? Whatever the future holds for this site, it is hard to argue that the neighbours are not going to miss the convenience of being able to walk to their favourite grocery store that has been there since the 1960's. On the upside there will be tons of freed up parking. 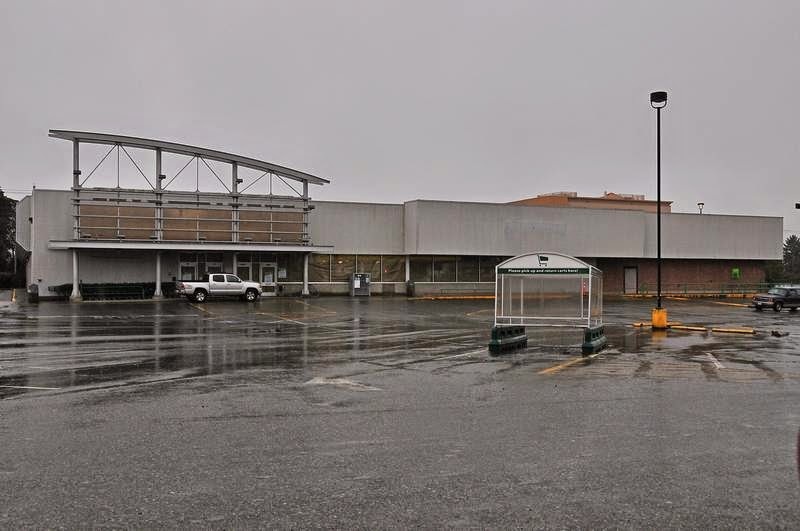 Of course without the Save On Foods store there will also be considerably less traffic to this mall which may have a negative effect on the other merchants in this mall. 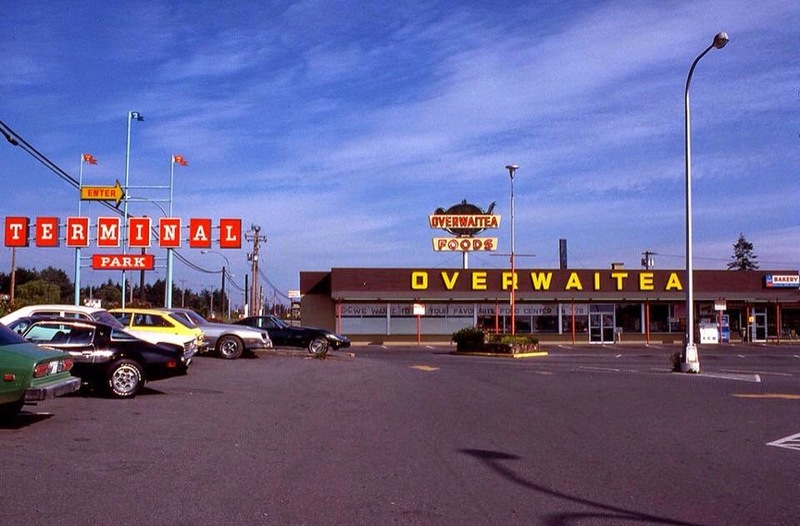 Picture of Overwaitea Foods in the 70's when it occupied the building where the Government Liquor Store now stands. We have 8 stores over 10km all along Old Island Hwy from Departure Bay north. We have 4 stores for the remaining geographical southern half of the city. You forgot Quality Foods Northridge and the Wal-Mart, which now has all sorts of produce, frozen and fresh stuff, meats. Yes. I forgot those. I haven't been to Wal-Mart in years (personal decision) and forgot they opened themselves up to sell produce etc. One could say that (if it wasn't closing), Target could have been added to that list as they do have groceries of some sort. It's terrible how underrepresented the southern half of the city is. 10 stores over 10 km seems a bit ridiculous while the south end loses out yet again.